LeBron James stands at mid-court during the Lakers win over the Houston Rockets on February 22, 2019 at STAPLES Center in Los Angeles, California. If you watched LeBron James play in January last year, and then compared it to what you saw in the 2018 playoffs, you understand what he meant when he hinted that he was about to jump a level coming out of the All-Star break. In short, his playoff mode was “activated,” James said after Wednesday’s practice, before he led L.A. to an important, come-from-19-points-down-in-the-third-quarter victory over Houston. On Thursday night at Staples Center, the 15-time All-Star scored 29 points with 11 boards and six assists in the 111-106 win that got L.A. back to .500 and 2.5 games back of the 8th seed in the West as they look to make a push towards the playoffs. It wasn’t the numbers so much as the way he drove to the basket repeatedly and relentlessly. The times in the second half he came over from the weak side on defense, alternating between a block, a steal or a drawn charge that fouled James Harden out in the final minutes. How he attacked the offensive glass. The massive hammer dunk he threw down over Eric Gordon. James may not be at 100 percent just yet after missing 18 games with the strained groin that saw the Lakers drop from the 4th seed to the 10th, but he’s getting closer. "I like where I am at and will continue to get better,” he said. “Tonight was a step in the right direction." Where the numbers come into play is as a substitute for our short-term memory of last season, which for many brings up an image of James smashing his way through the Eastern Conference and nearly securing a Game 1 Finals victory over seemingly unbeatable Golden State with 51 points, eight boards and eight assists before the infamous final sequence. In other words, we have a lot of evidence that LeBron will keep getting better as the season enters the home stretch, based on precedent. Take last January in Cleveland, when LeBron averaged 23.5 points on 50.6 percent shooting, 7.4 assists and 7.3 rebounds with 4.7 turnovers. Then flip over to March, when went for 30.9 points on 55.1 percent shooting, 9.5 assists and 9.5 rebounds with 3.7 turnovers. In the same number of minutes. That jump isn’t so atypical of his last several seasons, and really, isn’t atypical for the very few legendary players that have been through as many games as LeBron, especially at such a high usage rate. Nobody in the league better knows how to pace one’s body through the rigors of the day-to-day grind and have enough left for a playoff push. Of course, all the injuries this season, most notably to LeBron himself, have removed all of the margin for error James had in Cleveland as the Cavs were always assured a playoff spot, and he very rightfully wasn’t too concerned with having to win a few games on the road to higher seeds. It’s certainly not ideal for LeBron to fast forward his typical body calendar to potentially ramp things up at an accelerated pace from the past few seasons, especially coming off an injury, but he said he’s going to do what he needs to do. If you’re trying to understand why NBA veterans have to think seriously about the pace of a season, consider this: only six players in NBA history have played more combined regular season and playoff minutes than LeBron’s 55,750. And he’s still approaching 30-point triple-doubles most nights. It’s just something that should be considered if a defensive rotation is missed. Perhaps most importantly, there is a direct and immediate correlation between LeBron’s level of intensity, and that of his young teammates. Kyle Kuzma, Josh Hart and Brandon Ingram, who were each excellent against Houston, noted postgame how much of an impact seeing James attack has on them. 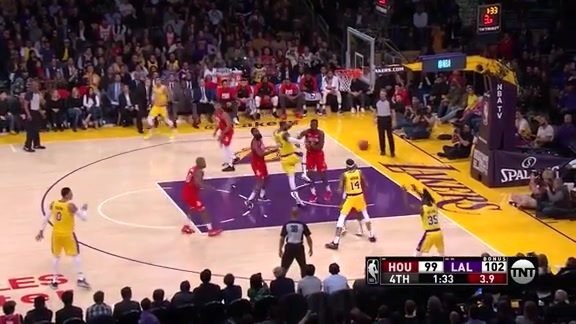 LeBron’s defense in the fourth quarter as the de facto center who rotated out to the perimeter when needed was a key in holding high-powered Houston to just 16 points in the period. The Lakers will need to call upon that LeBron-led intensity often in the final 24 games of the season. Thursday’s game was just one win, but it certainly sets the right kind of example of what the Lakers can and need to be.